This serial is part of the Social Sciences package on ScienceDirect. Visit info.sciencedirect.com for more information. 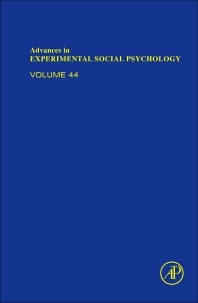 Advances Experimental Social Psychology is available online on ScienceDirect — full-text online of volume 32 onward. Elsevier book series on ScienceDirect gives multiple users throughout an institution simultaneous online access to an important complement to primary research. Digital delivery ensures users reliable, 24-hour access to the latest peer-reviewed content. The Elsevier book series are compiled and written by the most highly regarded authors in their fields and are selected from across the globe using Elsevier’s extensive researcher network.